When Greg Maddux was elected to the Hall of Fame today (thanks in part to you!!) the news was less that he'd made it, but that someone hadn't voted for him. We're in the second wave now: Maddux stories. Like his arm, they're better than most. What sets Maddux apart is an analytical, Pentium-quick mind that constantly processes information no one else sees. At home in Las Vegas he is a formidable poker player, detecting when an opponent has a good hand by the way he strokes his chin or suddenly stops fiddling with his chips. Maddux uses a numerical system in his head that tells him when to stand and when to hit at the blackjack table. But he is even better at analyzing hitters—so good that four times this year, while seated next to Smoltz in the dugout, he has warned, "This guy's going to hit a foul ball in here." Three of those times a foul came screeching into the dugout. Now, over a career that lasts two decades, a man is bound to luck into a couple of spooky-sounding predictions. (Hell, if you just walk around all day telling people, "Watch this," you're bound to look like a genius eventually when a truck hops a curb or a piano falls off a roof or some such.) But it was truly a pattern with Maddux, that his brain or his attitude or his sense of humor fed into tall tales. Our ever-sharp commenters pounced with a few more Maddux gems — you can see exemplars here and here and here and here. Here are some Maddux short stories. 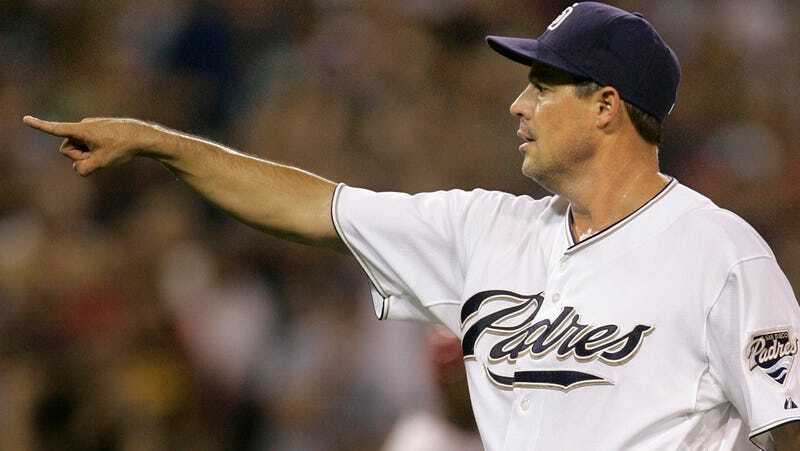 When they played together on the Cubs, Mark Grace once noticed Maddux walking around the pitching mound in a very strained, uncomfortable manner. Fearing his teammate was hurt, Grace approached the mound, only to find Maddux in an state of obvious physical excitement, the kind normally reserved for passionate endeavors. "Man, you really do love to pitch," Grace marveled. It's the best story I've ever heard from Grace. And that's saying something.